Chicken Chop is known to be a western dish and is commonly found in most western restaurants. In Malaysia, chicken chop is sometimes served in Chinese restaurants which serve western dishes and it is usually accompanied with a tomato based gravy. Recently, I tried cooking chicken chop for a change from the usual dishes we have for dinner. I bought two chicken legs (which consists of the thigh and drumstick) which I had it deboned. Apart from the chicken legs, the only other ingredients I used were cherry tomatoes and onions, excluding the marinade and seasoning, of course. It is fairly simple and not an intimidating dish to cook. To make it more elaborate, you can even add in fried potatoes (diced). 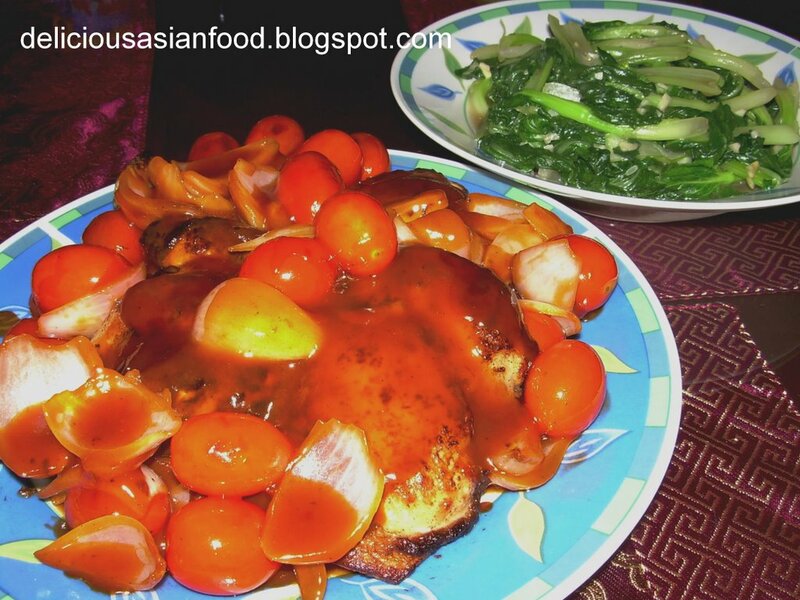 This is my recipe for Chinese-Styled Chicken Chop. Marinade the chicken for more than 1 hour using the marinating ingredients above. Heat a thin layer of oil in a frying-pan (I used a non-stick frying pan. If you don’t have one, add more oil for the frying process) and pan-fry the chicken on both sides till thoroughly cooked. Pierce meat with fork to test for thorough cooking (clear juice should ooze out if cooked). Remove chicken onto a plate leaving the juice in the frying pan. Add the onions onto the frying pan and stir fry for 1 minute. Add cherry tomatoes and continue to stir fry for 15 seconds or so. Add tomato ketchup and water and bring sauce to boil and thicken whilst adding sugar to taste. Pour sauce over the fried chicken and serve hot with potatoes or rice.